After my time near Kuching, I headed east towards areas I had never visited. 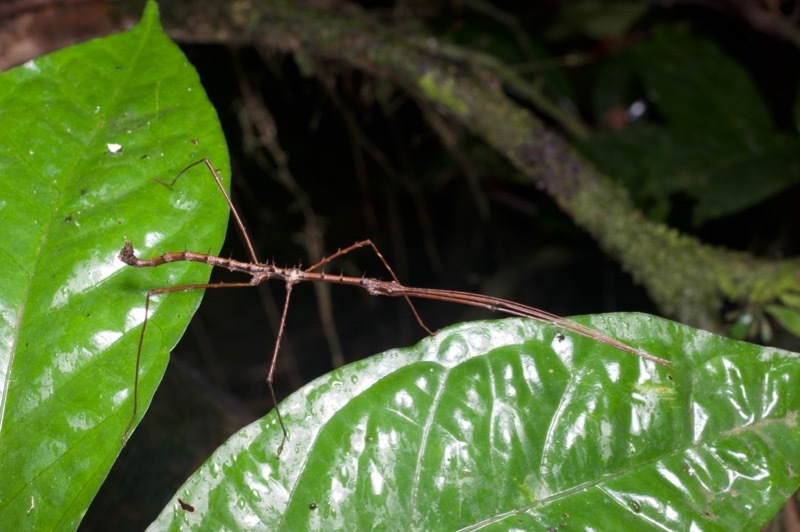 In the tropics especially, any time you travel a decent distance to an area you have not previously visited, you will encounter all sorts of creatures that you have not previously encountered. 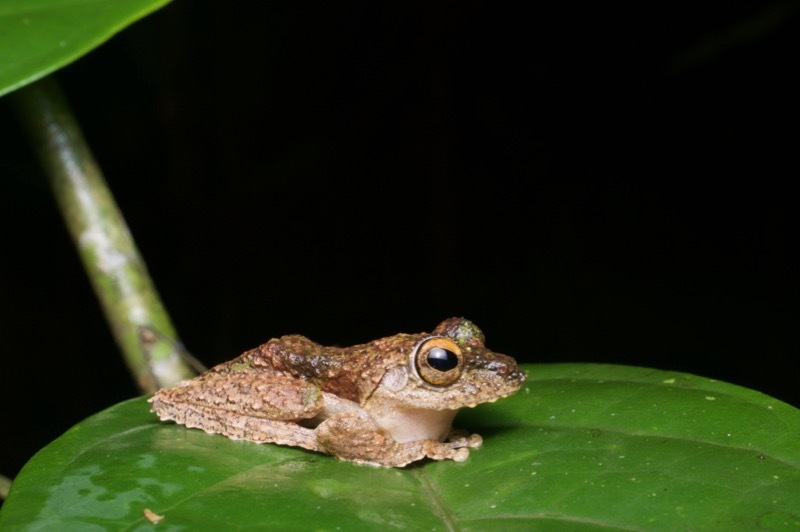 My next stop was Mulu National Park, originally chosen by me because it was included by the excellent Frogs of Borneo website in a highly selective list of four sites in East Malaysia to see frogs. 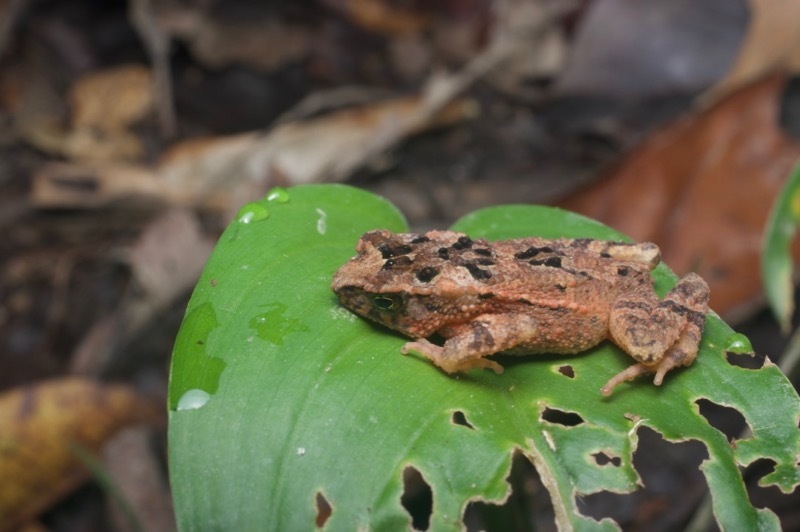 Oddly, when I learned more about Mulu I discovered that most people visit it not because of its inordinate number of frogs, but rather because of its spectacular scenery including spiky limestone outcrops and gigantic bat-riddled caves. 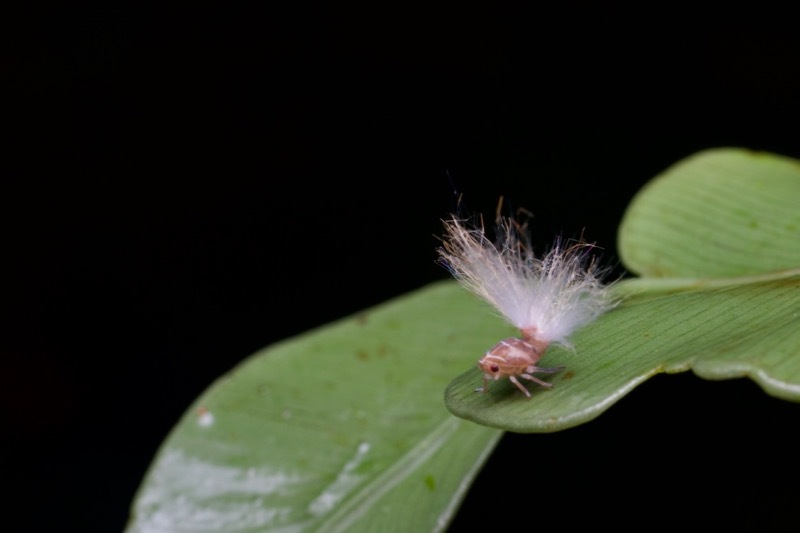 I was joined at Mulu by Kurt "Orion Mystery" G, whom anyone who pays attention on this forum will recognize as one of the world's finest macro photographers. 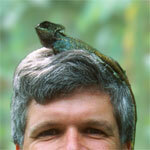 In fact, since Kurt posts here frequently, you might recognize some of the individual animals from his previous posts. Hopefully I've procrastinated long enough in writing up my account that you won't remember in detail how much better his photos are than mine. Kurt and I didn't take the multiple days required to trek out to the spiky limestone outcrops, but we did visit one of the most gigantic and famous caves. 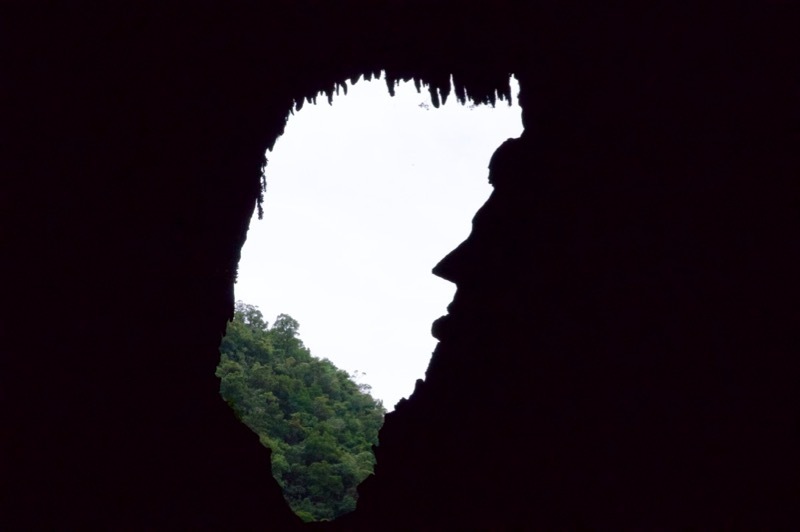 This is Deer Cave, which is famous not only for its gigantic-ness, and its population of over three million bats, but also because when you go inside and look back at the entrance from just the right angle you can see that some joker carved a giant profile of Abraham Lincoln in the cave wall. There is no doubt a conspiracy theory about this. 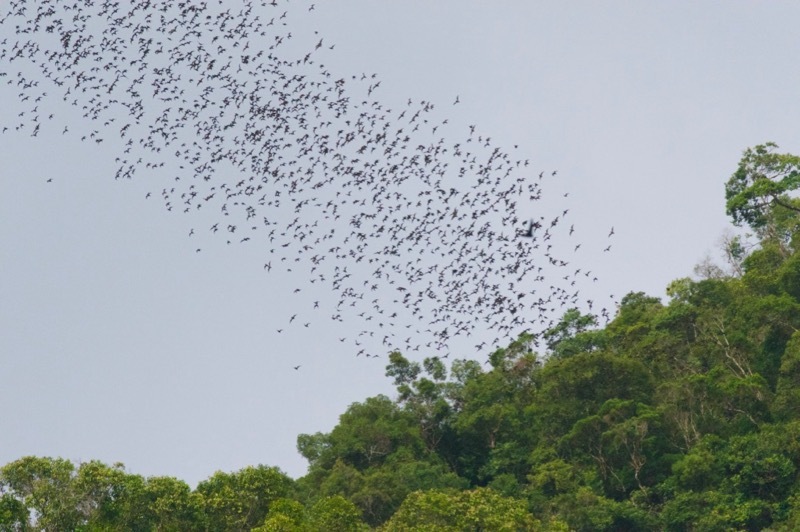 The best thing about Deer Cave is that most of those three million bats come flying out every night to reduce the population of mosquitos that would otherwise be biting you while you look for frogs and snakes. And you can sit on tastefully arranged wooden benches and watch those bats swirling into the sky, a fantastic spectacle that takes more than an hour (maybe a lot more than an hour, but eventually it got dark and we had to go look for frogs and snakes). 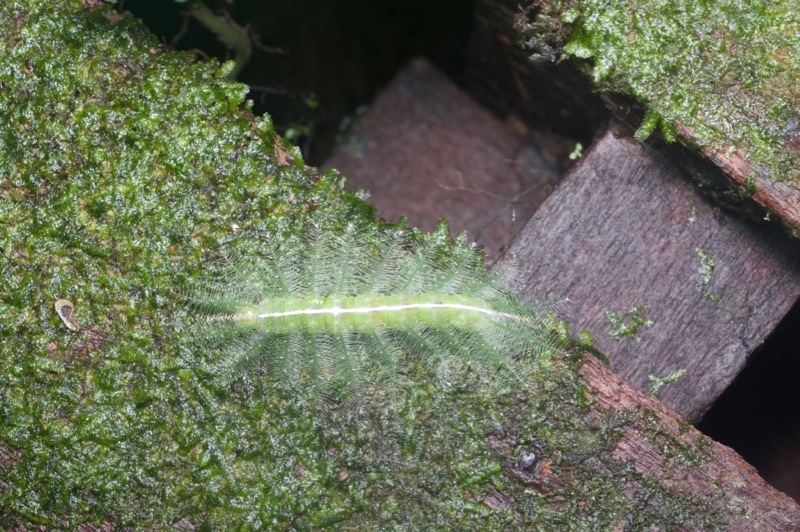 Let's quickly dispense with some of the weird bugs at Mulu before diving into the herpetological wonders, shall we? Here's a handful of my favorites. 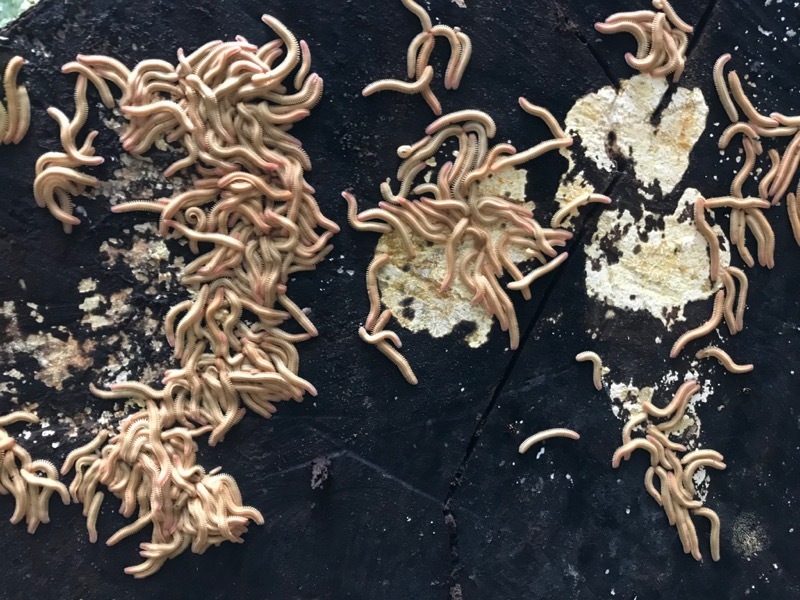 Noodle Millipedes (Pseudodesmus sp.). These are on a tree trunk. Mmmm, pasta. 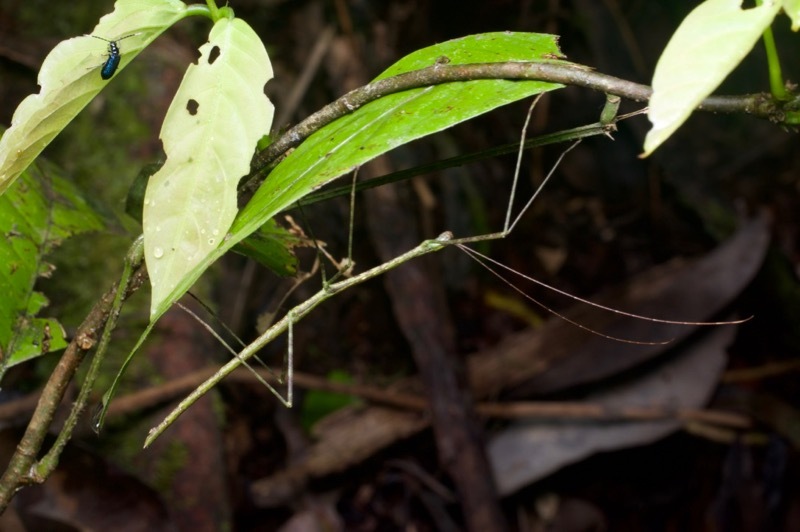 Like any reasonable person, I love mantises, so I was a little disappointed not to see a single mantis when I visited Malaysia in 2017. 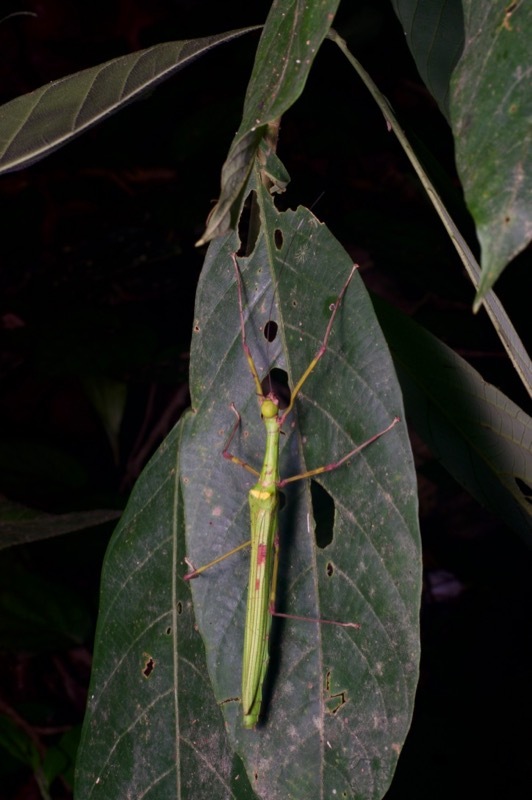 One night at Mulu, I spotted this pretty little green under-leaf percher and excitedly told Kurt "Hey look, my first Malaysian mantis!". 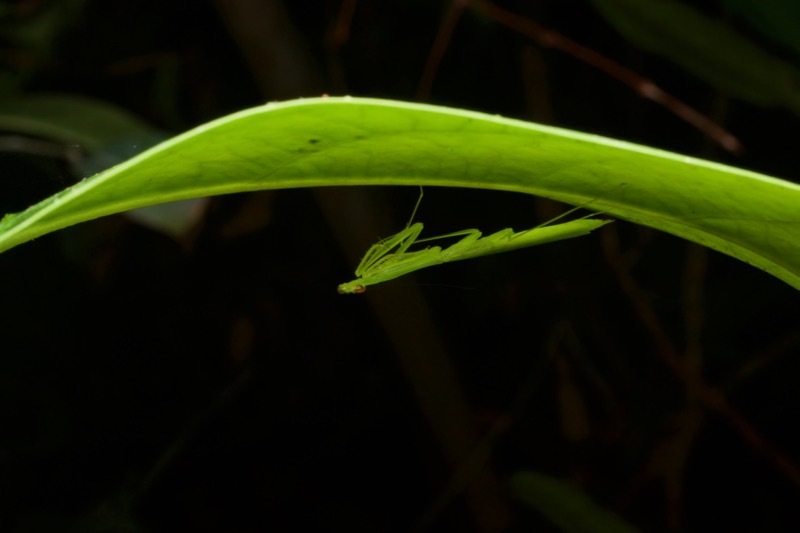 He gave it a quick disdainful glance and replied "That's not a mantis". "What do you mean, that's not a mantis?" 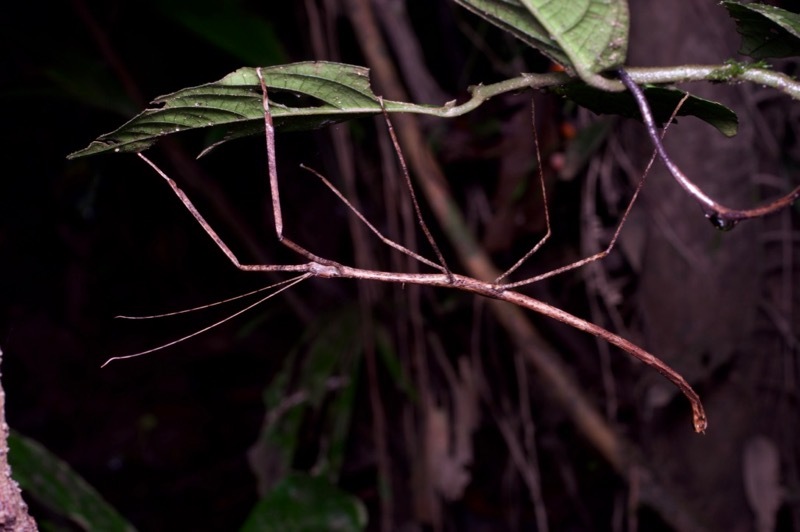 "That's a poor man's mantis. 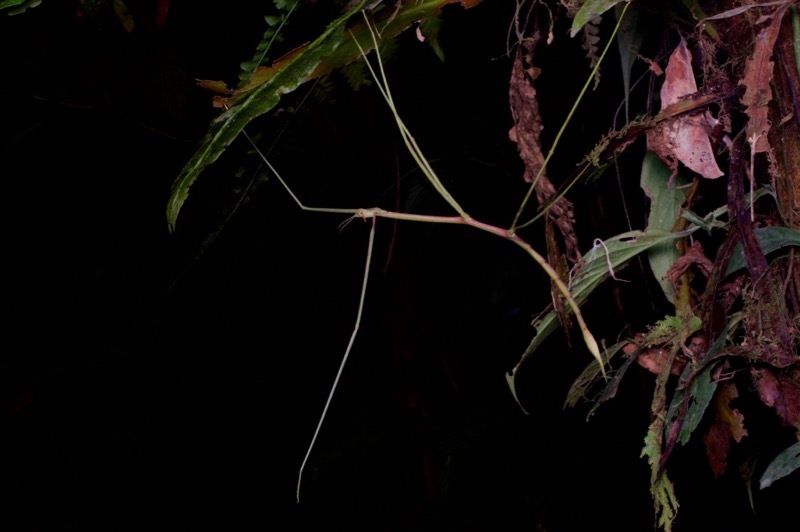 I'll find you a real mantis." The next night, Kurt let out a "Ha!" as he stared at the vegetation ten feet off the trail, and then showed me this. 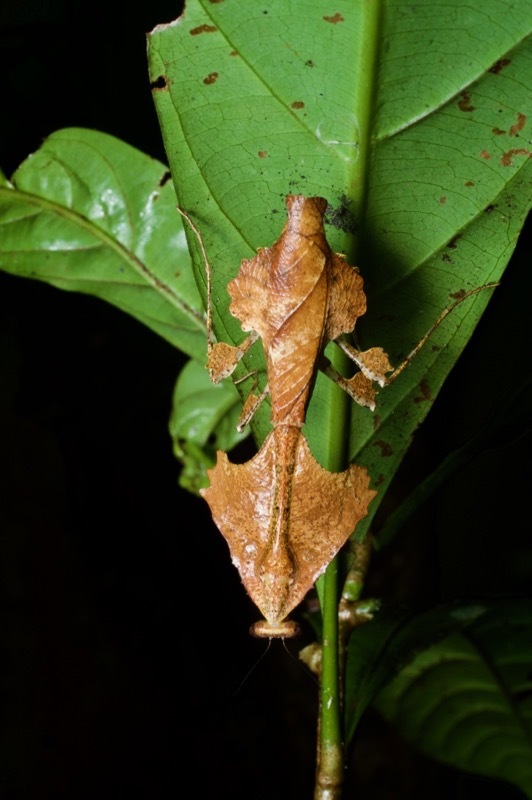 Dead Leaf Mantis (Deroplatys desiccata). 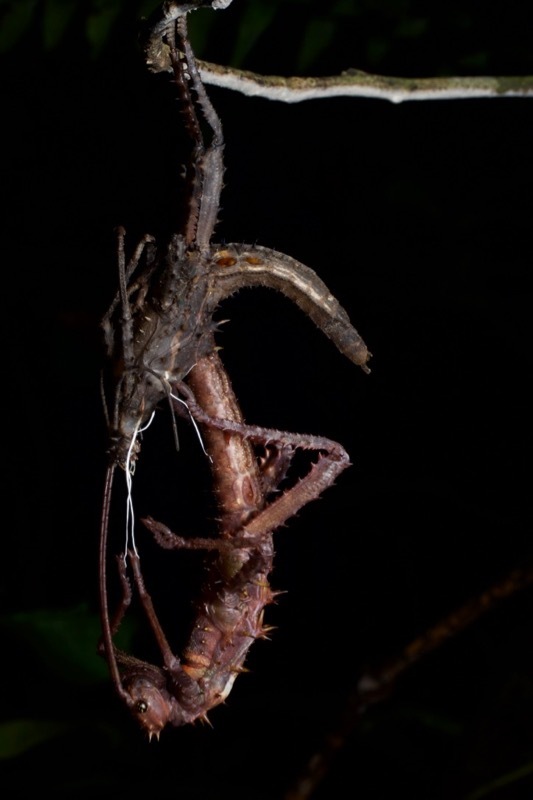 A real mantis. 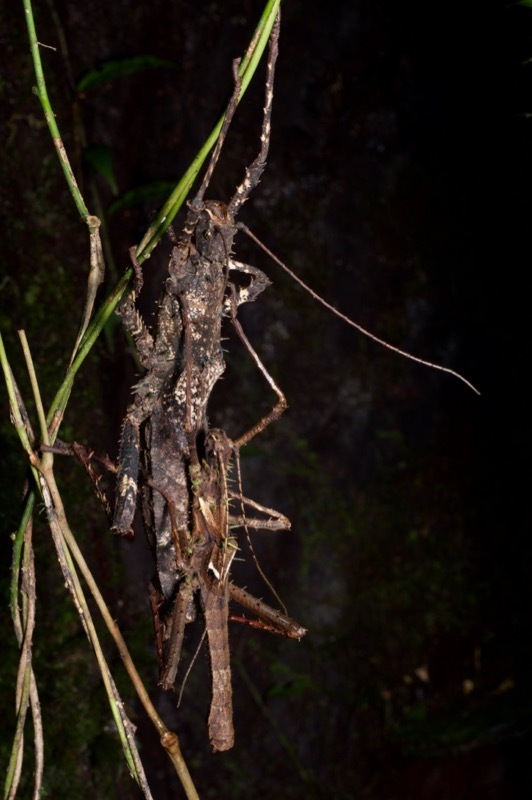 And now, a sampling of phasmids. 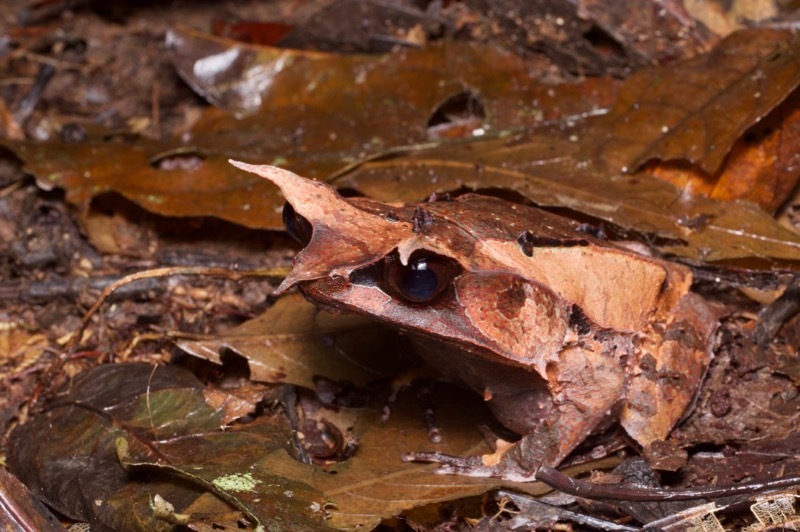 Kurt and I (but mostly Kurt) spotted a few more Malayan Horned Frogs, which as you know are the best. This one had particularly long and droopy eyebrows. The frog species we saw the most of was the Rough-sided Frog, which often appeared sitting on the trail or very close by. 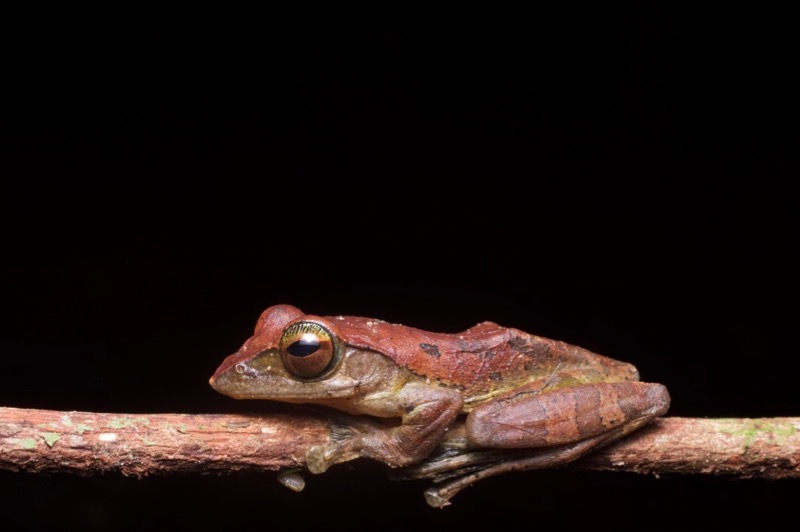 Some frogologizers classify this in Pulchrana, others in Hylarana. The frog doesn't care how it's classified, but it does care that three million freakin' bats aren't enough to eat all the mosquitos. Brown Marsh Frogs were also common, and looked a lot like somewhat streamlined Rough-sided Frogs. It took me at least a full evening to understand that we were dealing with two different species that had similar stances, behaviors, lumpy skin, etc. 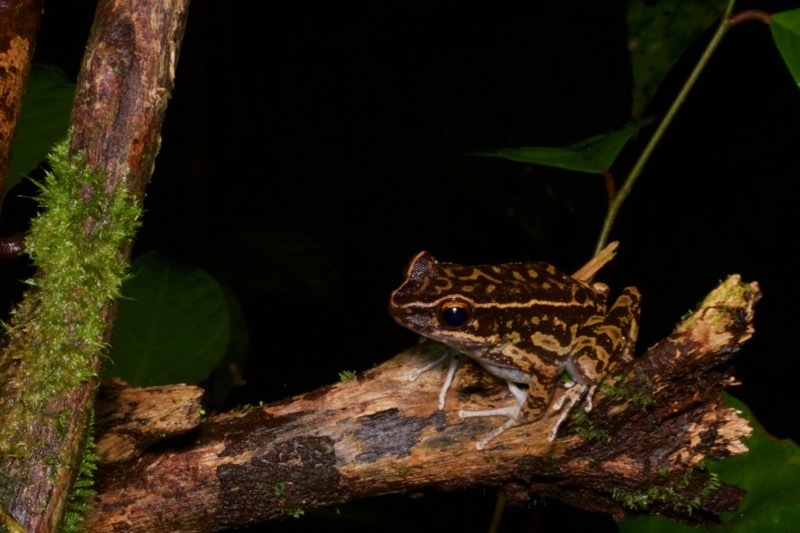 This striking individual was the largest single frog I saw anywhere in Borneo. It was the size of a really big frog. 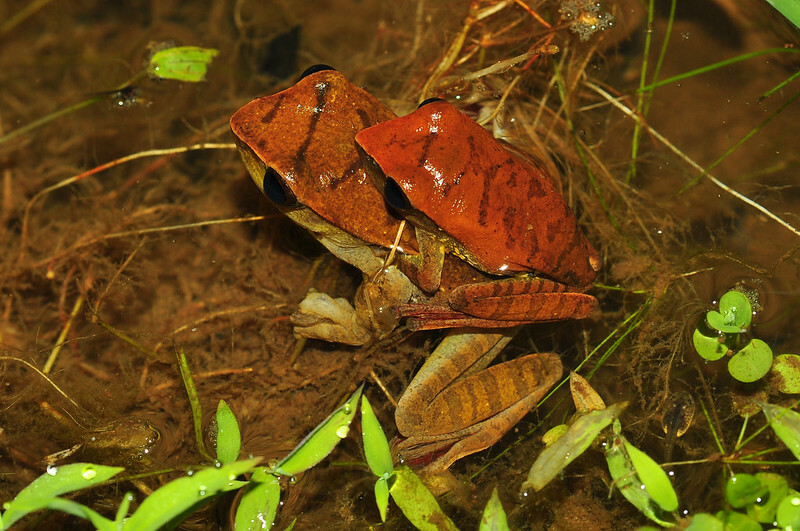 Striped Stream Frogs, along with their near-lookalike cousins Spotted Stream Frogs, are well-known and highly distinctive. I had expected and hoped to see them at Kubah, but had failed there two years running. At Mulu we saw a few, and I quickly learned that along with their distinctive appearance they also had a distinctive behavior of being extremely restless and jumpy. We saw two or three of them before I managed to get a single focused photo. We saw quite a few brown treefrogs on small trees and bushes and even trailside interpretive signs. 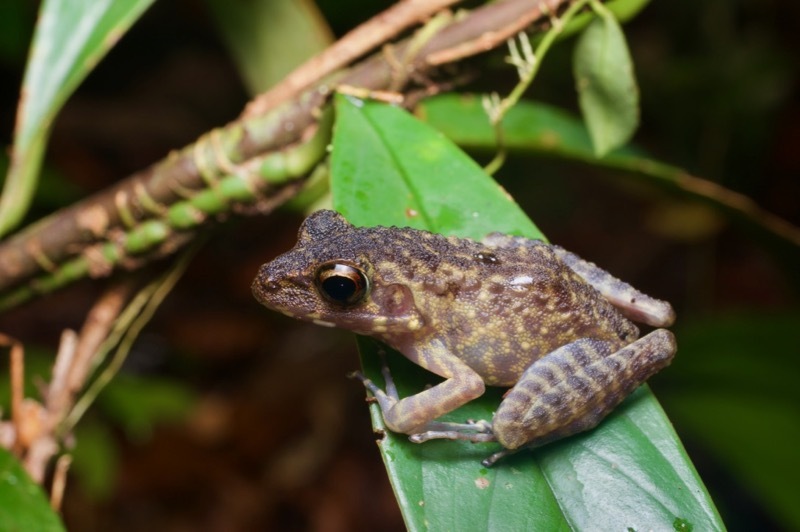 I assumed most of them were the same species, but after studying my photos and getting identification help from Borneo frog expert Dr. Alexander Haas, I discovered that we had seen a few different species. 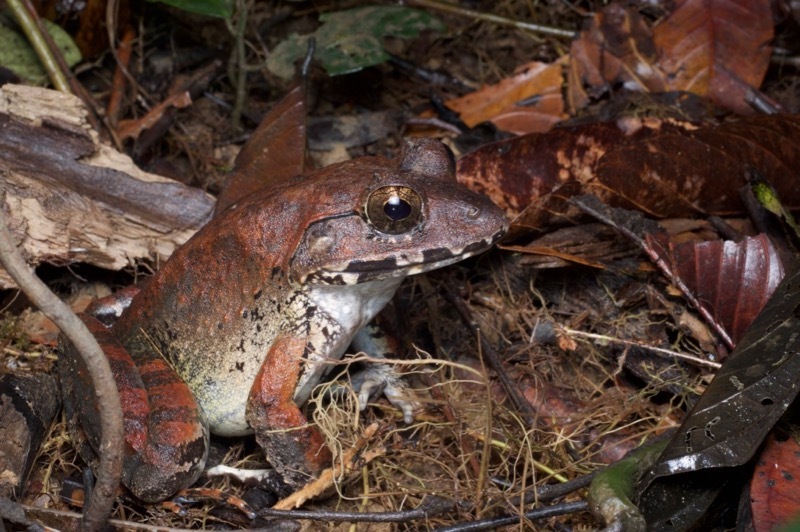 This one is an attractive frog that deserves a better name. This one was covered with variously colored spots and blotches, but that's not always the case for this species. Often they look even more like the previous species. 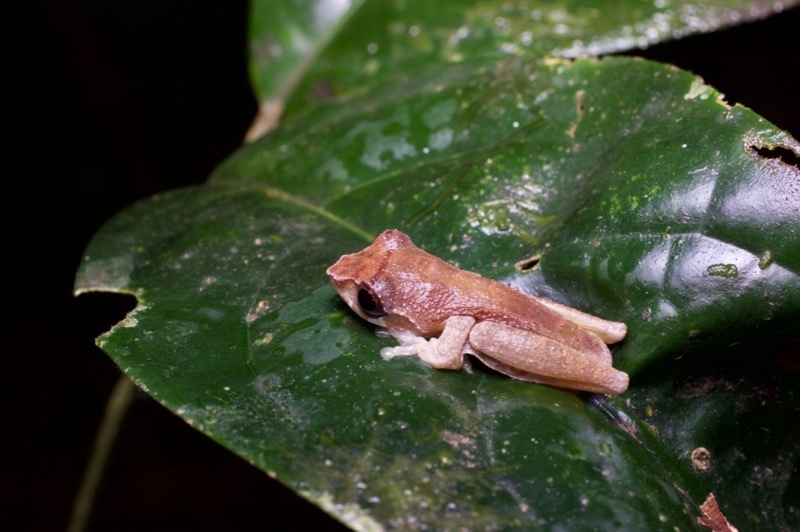 I was so confident that this small brown treefrog was a species we had already seen that I didn't bother trying to get a better photo of it. 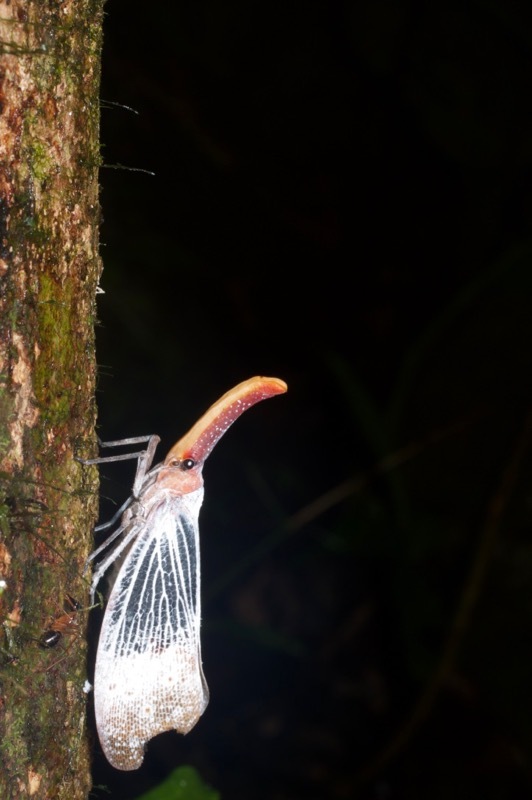 Turns out we only saw this one individual, as this species is usually high up in the trees. 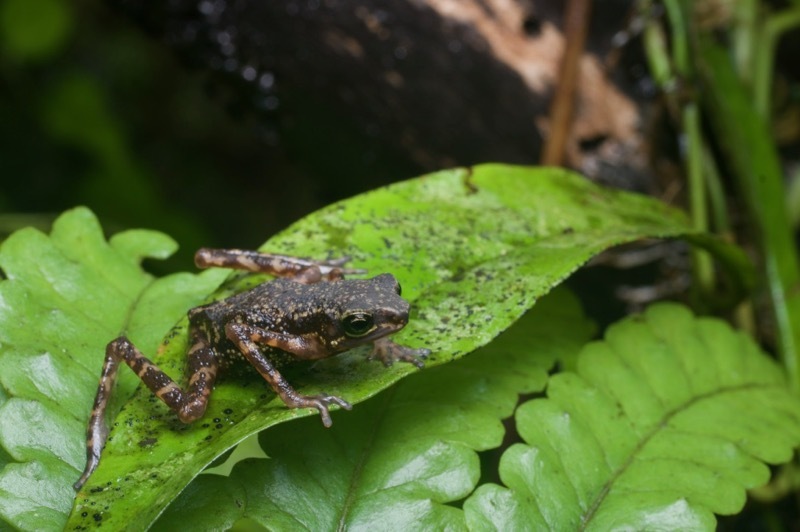 I do get full credit for recognizing that this frog had a distinctive fringe and was therefore different from the other small brown frogs we had seen. Full credit! 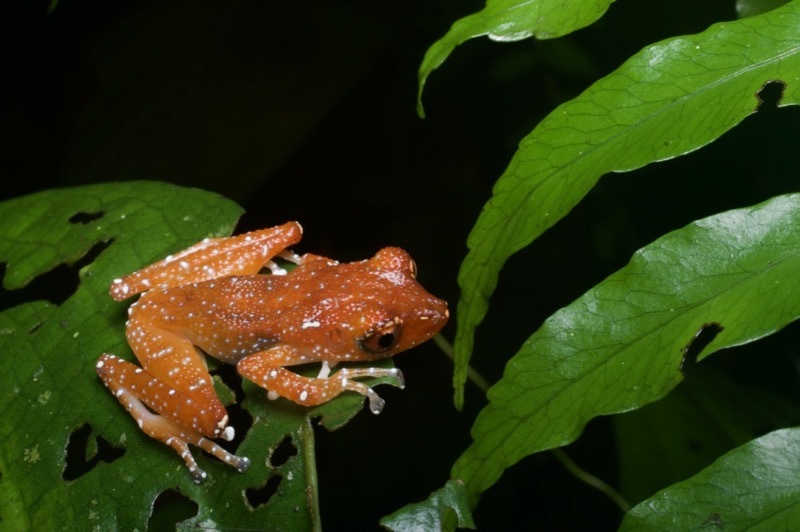 I can't resist showing another Cinnamon Frog, just because they are so cool. The orange skin! The little white dots! The eyes full of unfathomable loneliness! Here's one of your standard small toads, though admittedly a somewhat attractively patterned individual. 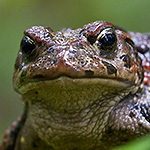 I threw this photo in here just so you remember what your basic toad looks like. 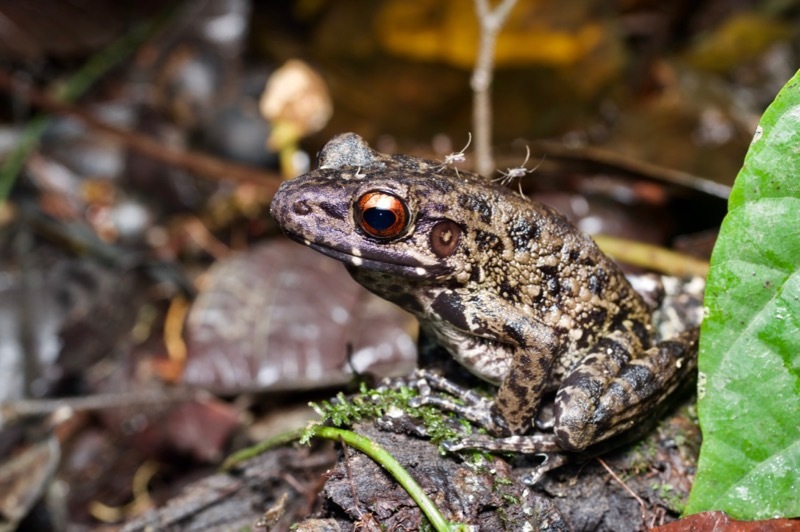 This is a toad, but definitely not one of your standard toads. It might be part spider. 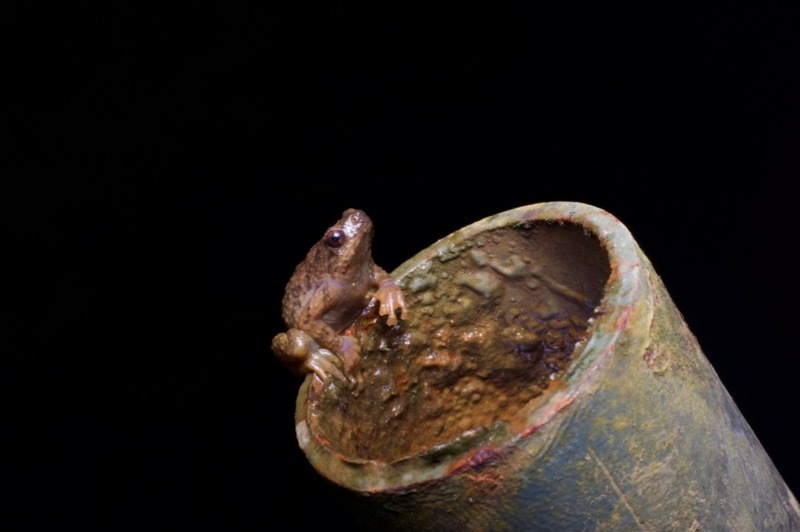 Male Tree Hole Frogs hang out in water-filled tree holes, where they chirp to the universe hoping that a wandering female will pop by to start a family. They aren't super strict about their definition of "tree hole"; water-filled pipes being used to support interpretive signs will do just fine. 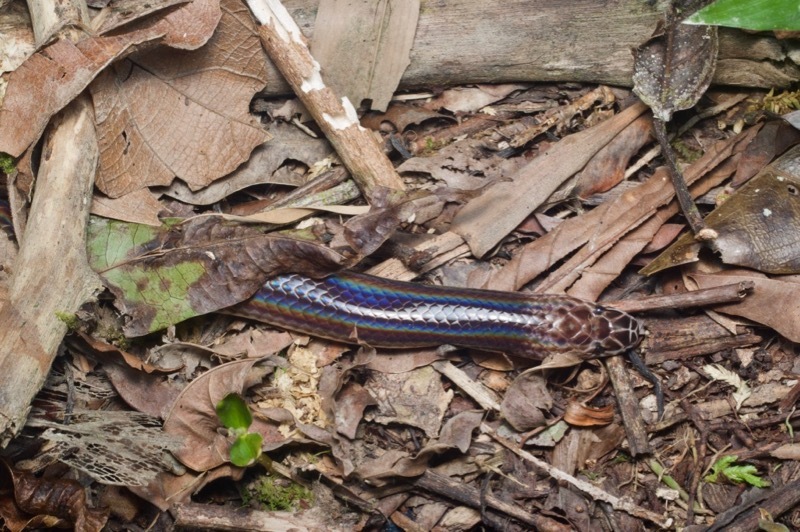 We saw a few types of skink scuttling in the leaves and basking on the boardwalks. This was the most dramatic one. 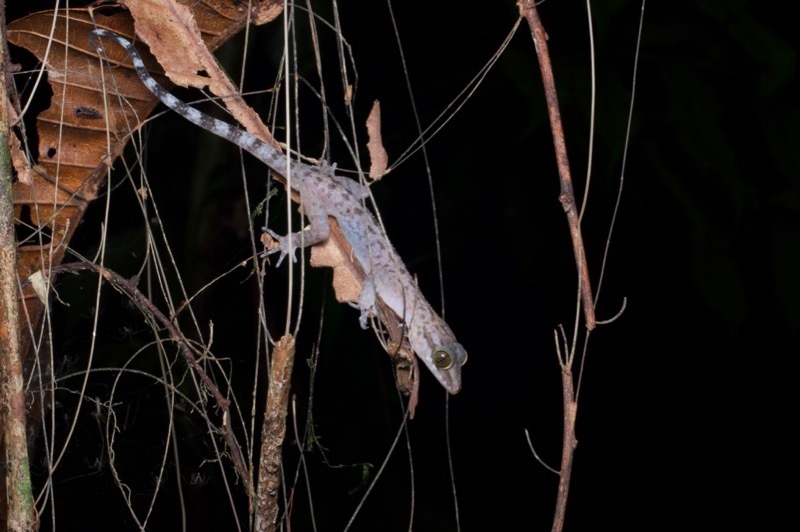 Numerous Cyrtodactylus geckos patrolled the vegetation at night. Here are a couple of the more photogenic ones. 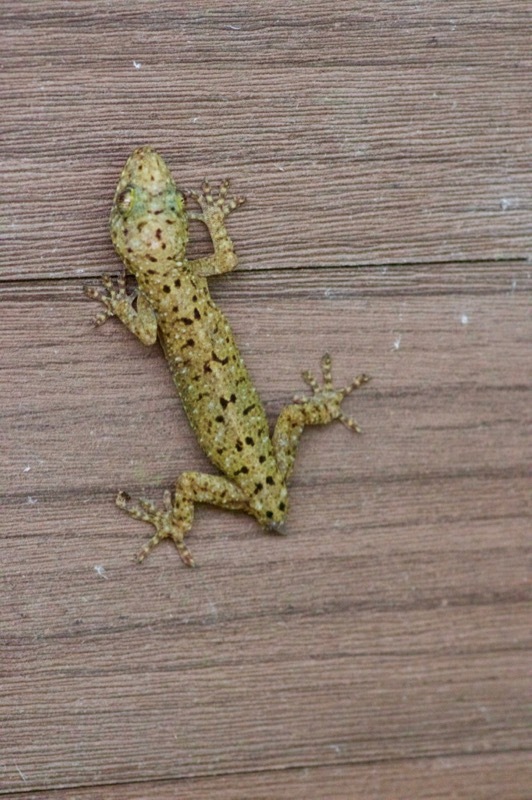 We had a few of your standard house geckos on our cabin, including this little guy. 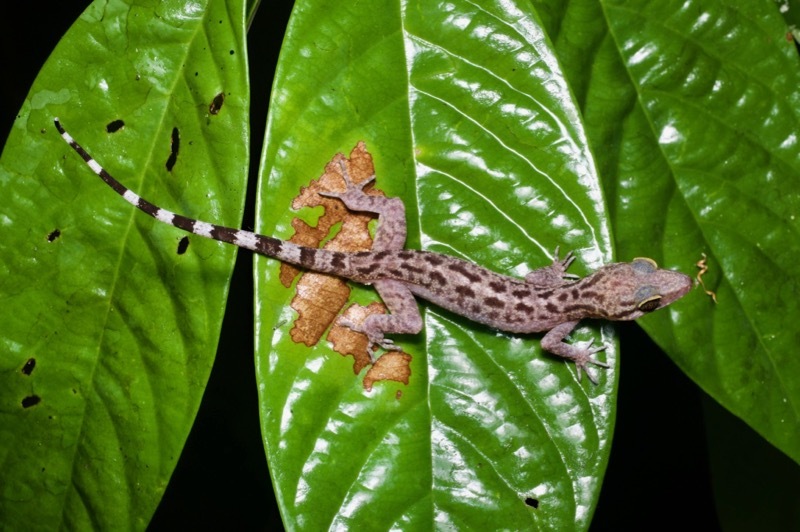 I found my second Cat Gecko at Mulu. 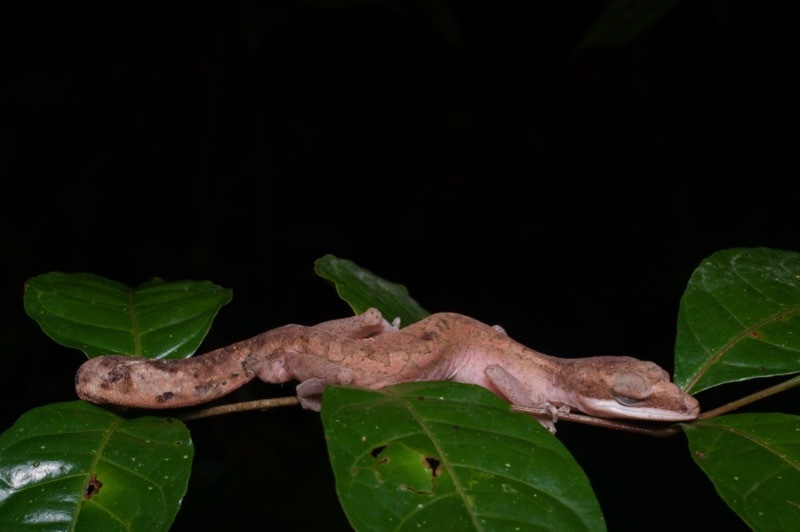 Unlike the one I found near Kuching, this one was fully grown, and did not escape after one photograph. 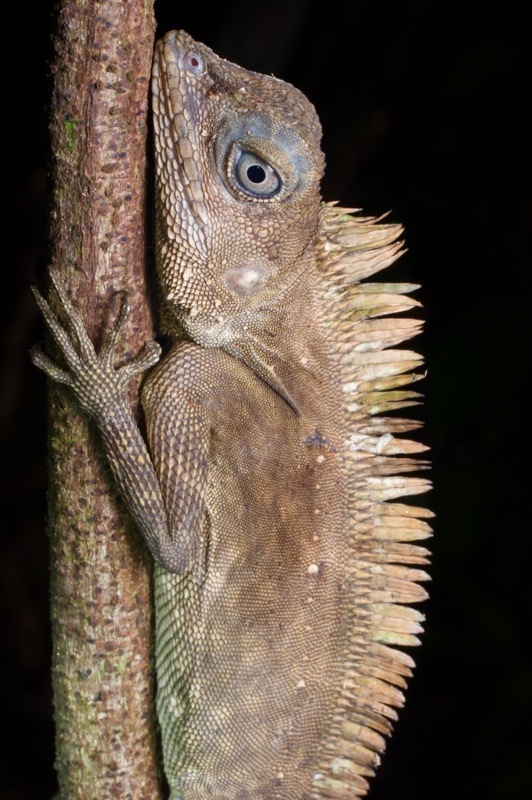 The local Angle-headed Lizard is Gonocephalus bornensis, though there's some controversy over whether the very similar Gonocephalus liogaster is also found here. In any case, this spiky fellow is definitely G. bornensis. 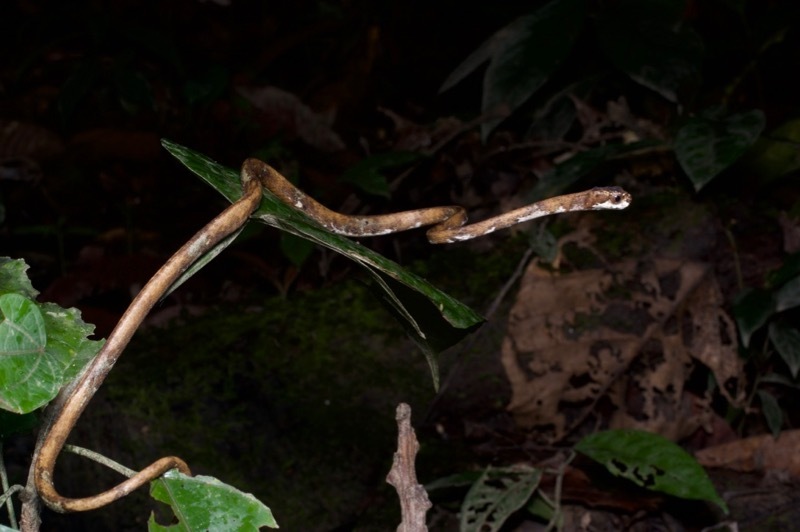 This is sometimes spelled G. borneensis, with two "e"s, but it seems the original description used a single "e" and it's too late to fix that now. 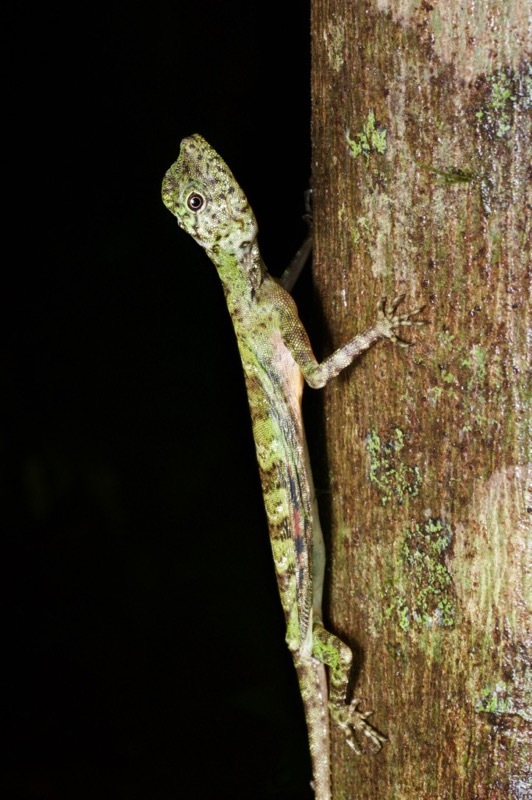 Flying Lizards spend much of their active hours running up and down tree trunks picking off tasty bugs. They also spend much of their resting hours flattened down on those same tree trunks. This one had been flattened down, but I detained it for a few moments so we could check its wings (OK, let's call them by the right name, "patagia" — you happy now?) to determine the species. When I placed it back on the tree, it adopted the more alert posture shown here, and gave me the stink eye. 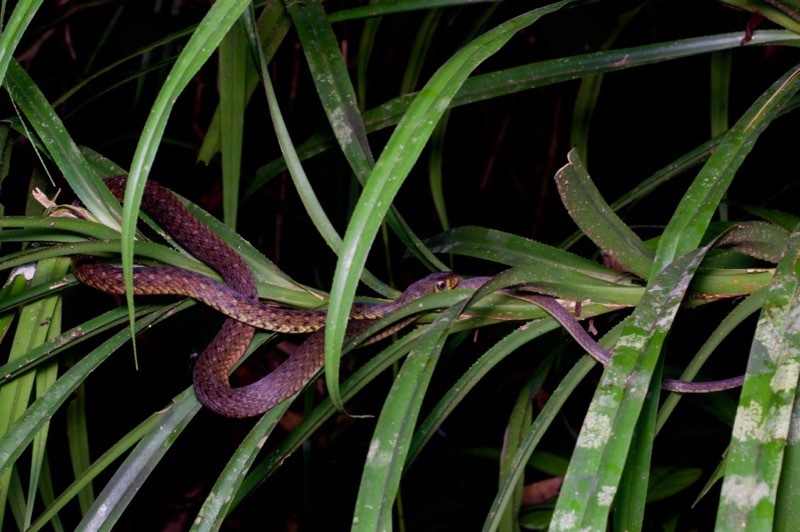 Unlike near Kuching, not all of the snakes we saw at Mulu were venomous. 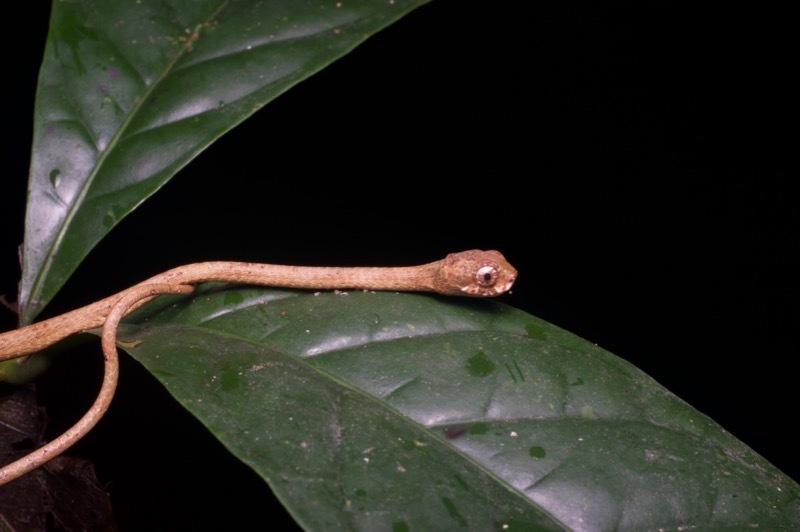 Our first snake of the park was this extremely non-venomous and extremely cute Blunt-headed Snail-eating Snake. This one even has an extra level of cute because it's a youngster. This darker one is fully grown. It's still pretty darn cute though. 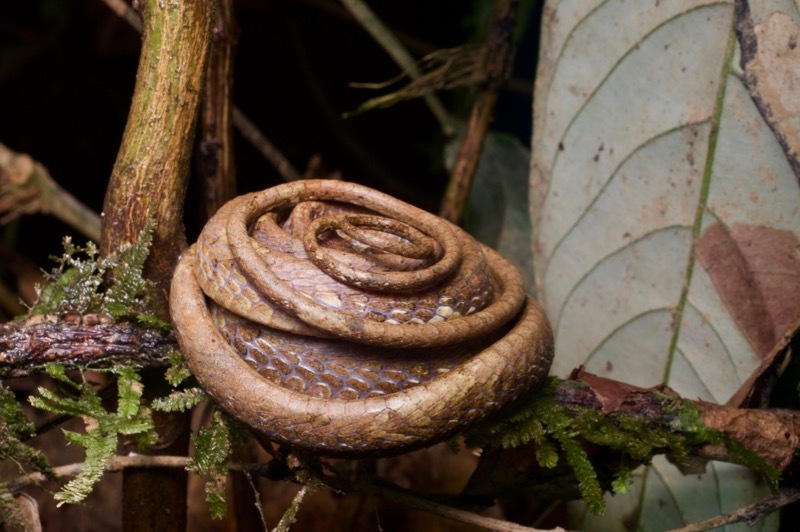 Sometimes when this snake is disturbed it will adopt a behavior known in scientific circles as "The Cinnamon Roll Defense". 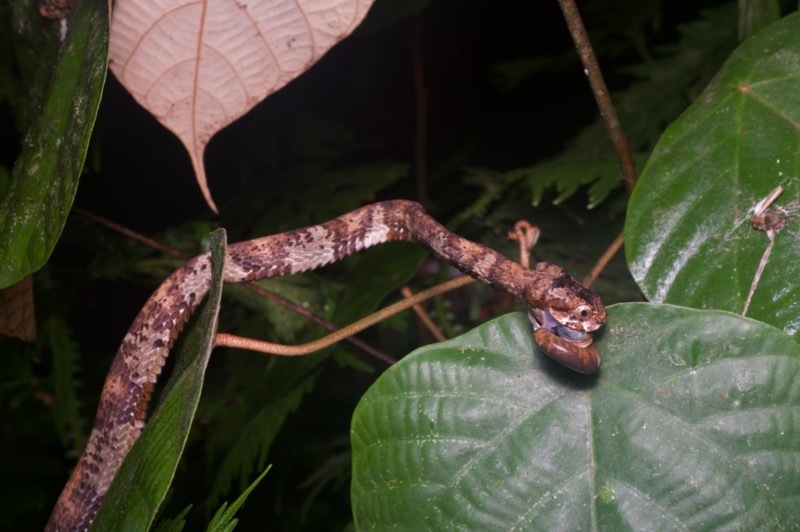 Kurt found this snail-eating snake actually eating a snail. Bonus points for eponymous behavior! 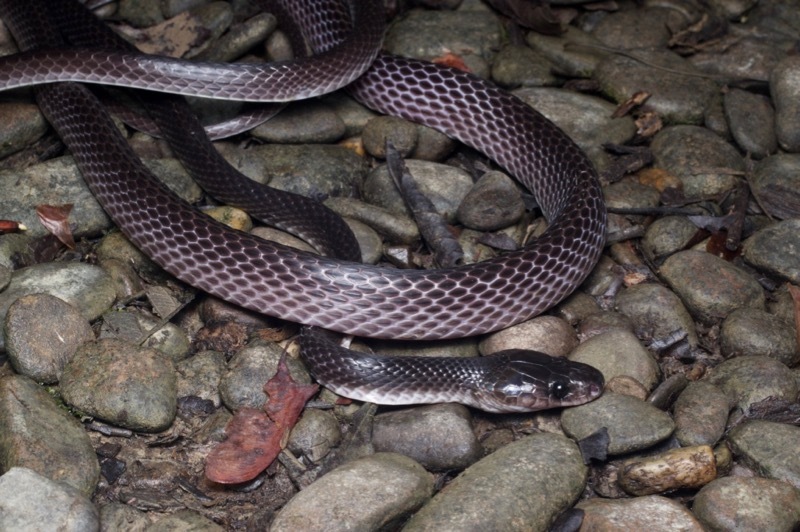 Last year I had seen a Slender Wolf Snake in Peninsular Malaysia but it had escaped before I got any non-terrible photos. We were extra careful with this one to avoid a similar outcome. It's not a particularly good photo, but it's at least non-terrible. 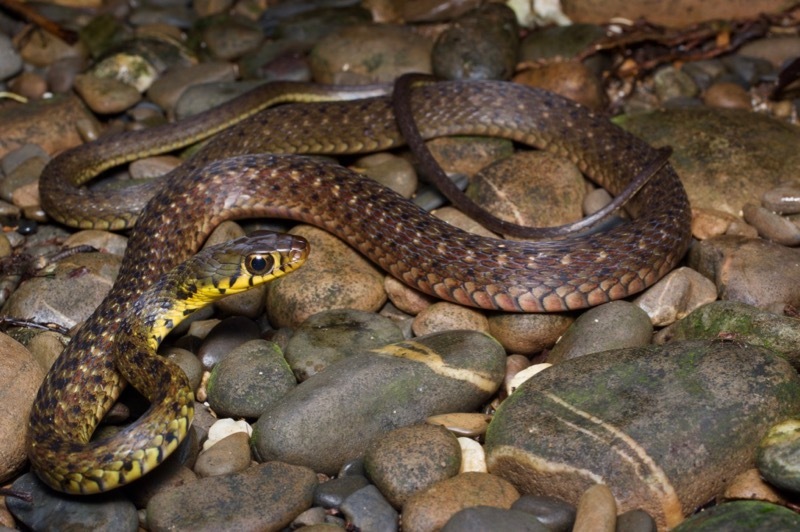 The references say that the Large-eyed Water Snake is both aquatic and terrestrial. This one was sleeping at least six feet off the ground, so I guess it's arboreal also. We posed it on the ground before releasing it back where we found it. 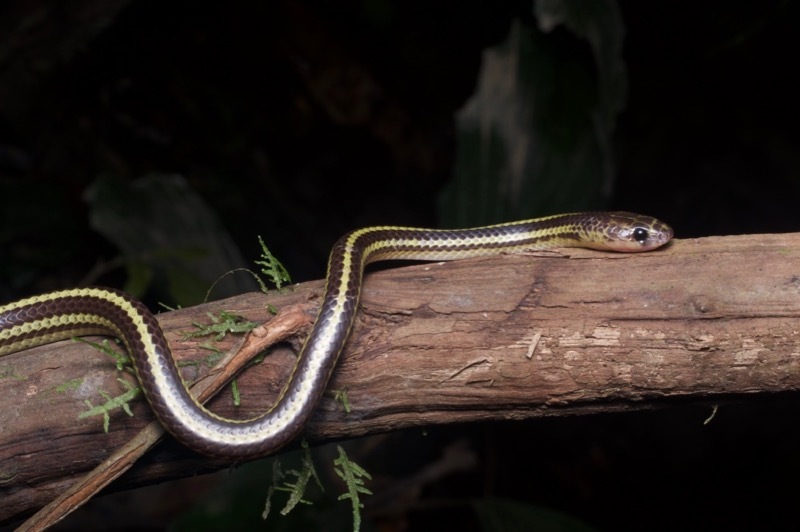 This Striped Dwarf Treesnake was also found sleeping in a tree at night. 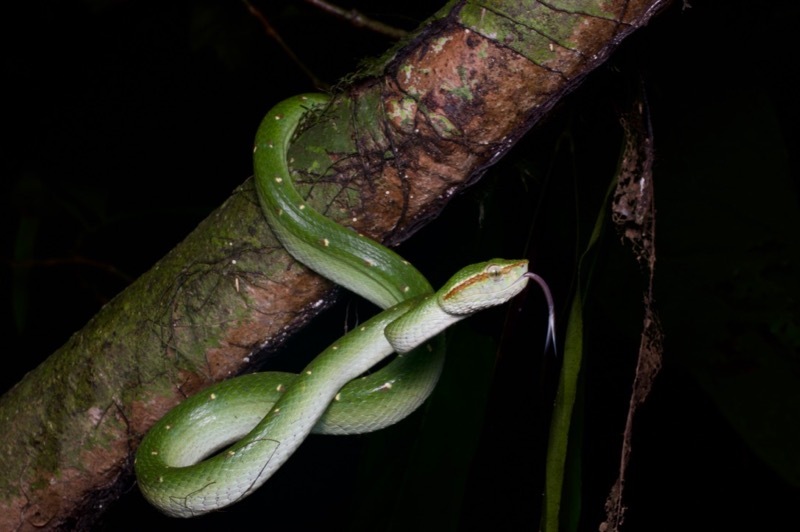 The next two snakes look about as different as two snakes in the same genus have any right to be. 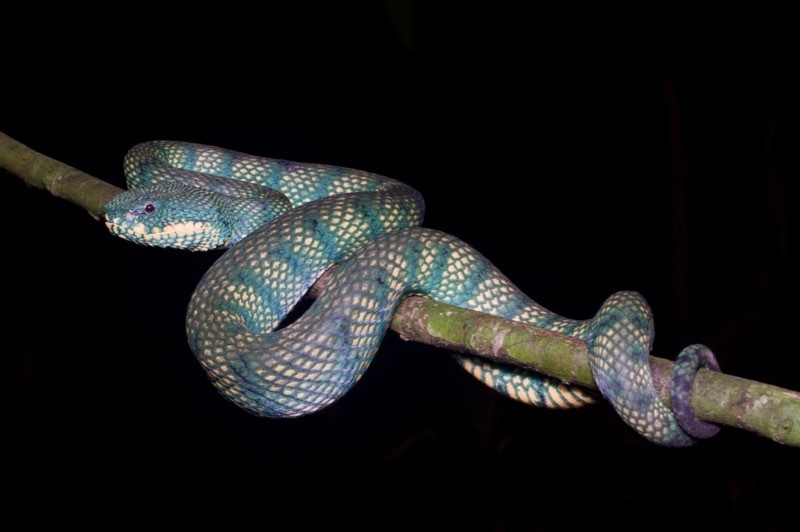 I don't want Boiga drapiezii to feel bad, but c'mon, that Boiga dendrophila is just way prettier! I walked right past this next snake, which seems not too embarrassing since it was almost entirely covered by leaf litter. 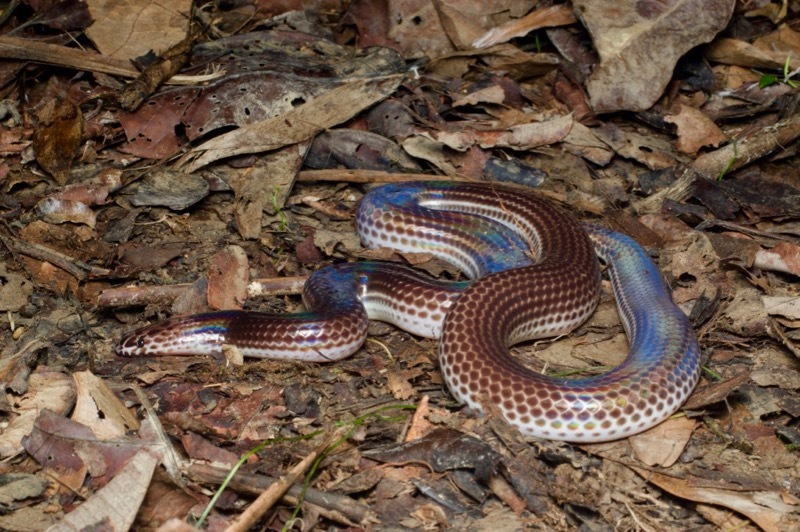 However, it really was pretty embarrassing, because just the slightest light on the smallest part of this snake's skin reflects a crazy kaleidoscope of color. Good thing Kurt was a few steps behind me to find all the cool things I missed. 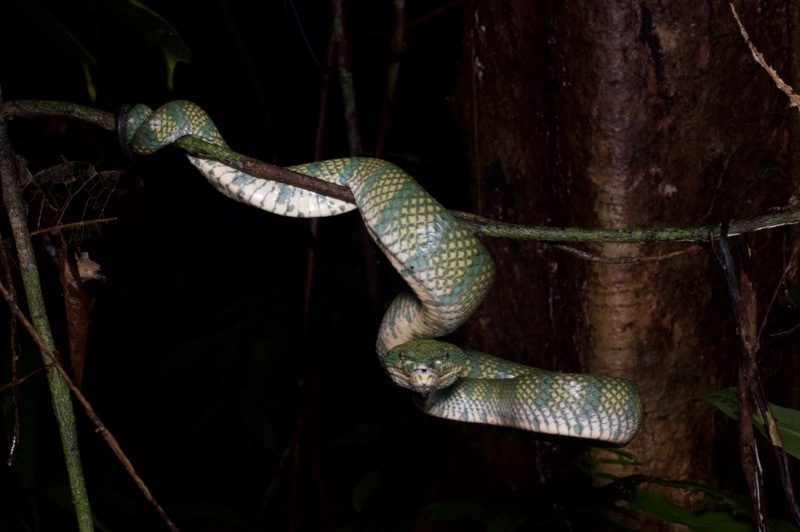 Mulu's most common snake, or at least most commonly-seen-by-us snake, was our old friend the Bornean Keeled Pit Viper. Mostly we saw small-to-medium green ones, which were males and young females. 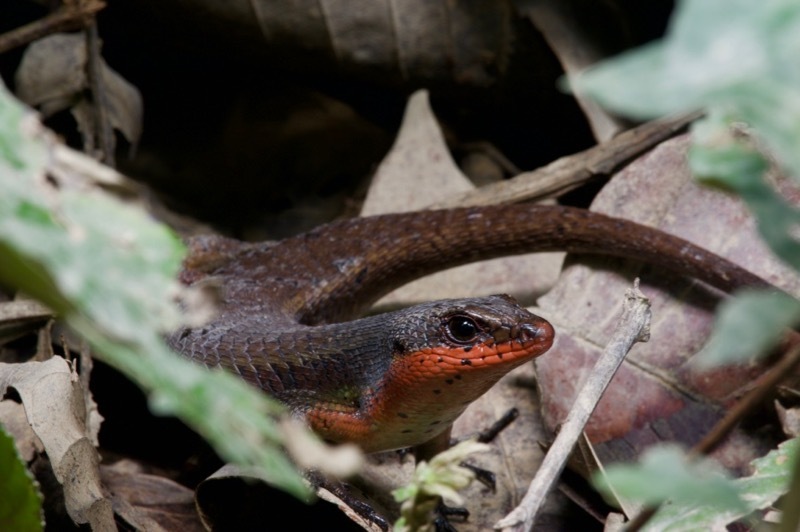 Adult females are much larger than adult males, and also have a beautiful pattern of strongly-outlined scales and crossbars. We ended up seeing two of them. 1) They are reasonably common in the right areas. We ended up seeing four of them in three nights. 2) They can bounce away from tree to tree extremely quickly. 3) They do not wish to be approached closely. These three facts together explain how the two of us together came away with a grand total of one, count 'em one, photo of a Westen Tarsier. And it is a terrible photo. Part 3 coming soon. I forgot to mention before that there will eventually be five parts. Love the short scripts with the pics. I think I have some parchute flies that look like that in my fly fishing vest!!! Enjoyed the Mulu post. You certainly nailed it with the Megophrys this time. I'd swear that Abe's beard has got bushier since we were there. 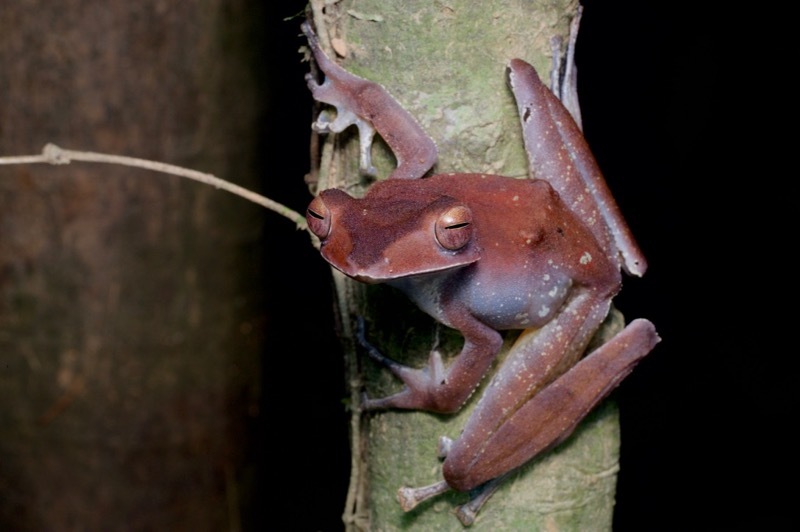 Your photo parade of 'Brown' tree frogs has now got me thinking. I had previously convinced myself that these were R.harrissoni but they are quite different to the one in your post - back to the drawing board. (just noticed the male in my shot has yellow blotches on his flank too). Congratulations on the Tarsiers - I've been told by a couple of people that the species has a strange odour which sometimes gives away it's presence in the forest. Did you find any smell around them? 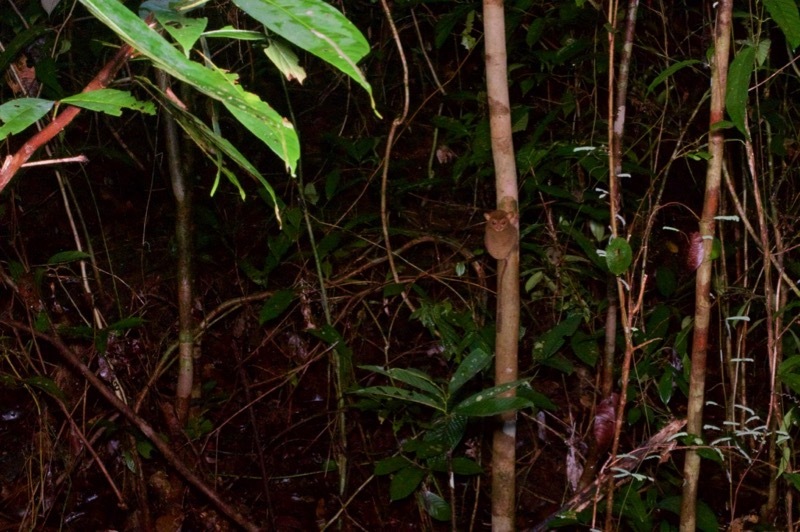 We didn’t notice any distinctive “tarsier smell”, but there are a lot of unfamiliar smells in the forest so we might just have been unfamiliar with it. 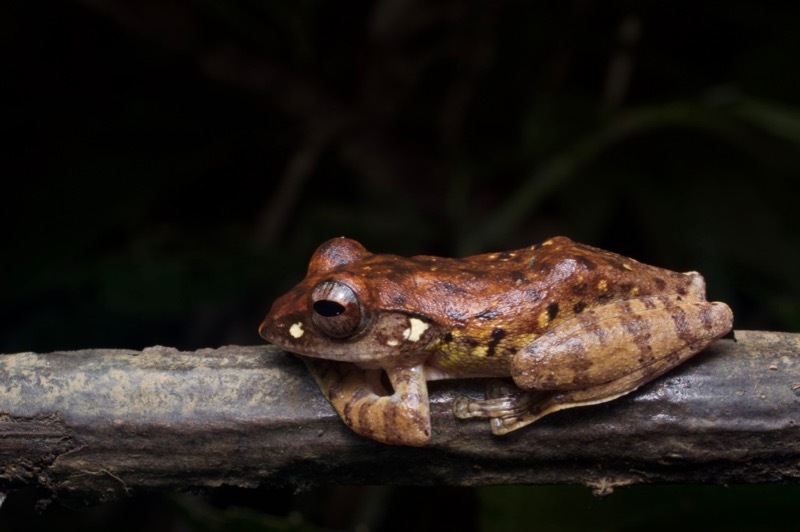 Based on the IDs I got from Dr. Haas about various brown treefrogs, I might guess Rhacophorus fasciatus, but it also wouldn’t surprise me if those are indeed Rhacophorus harrisoni. R. harrisoni at least sometimes has yellow on the undersides of the limbs. Badass post! Man, this is exactly what I love about FHF. Stellar narrative AND photos, dude. Stellar. 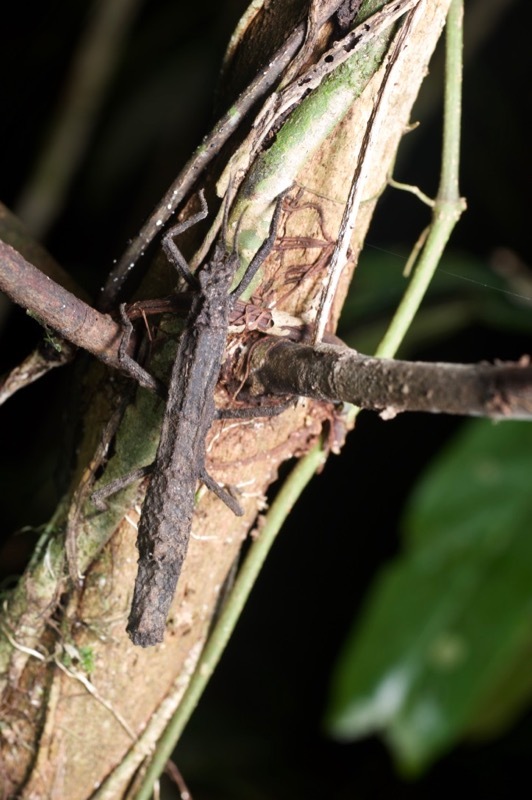 I know range maps can be misleading but I have now noticed the IUCN Red list map shows R.harrisoni as present to the east of Kuching whilst my pair was photographed on the Kalimantan border to the south. 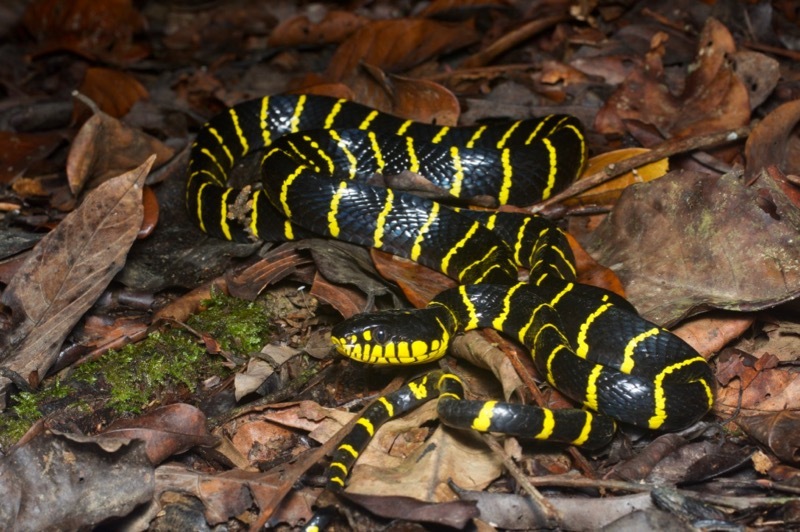 Whereas the R.fasciatus range shows a small population in the right area. 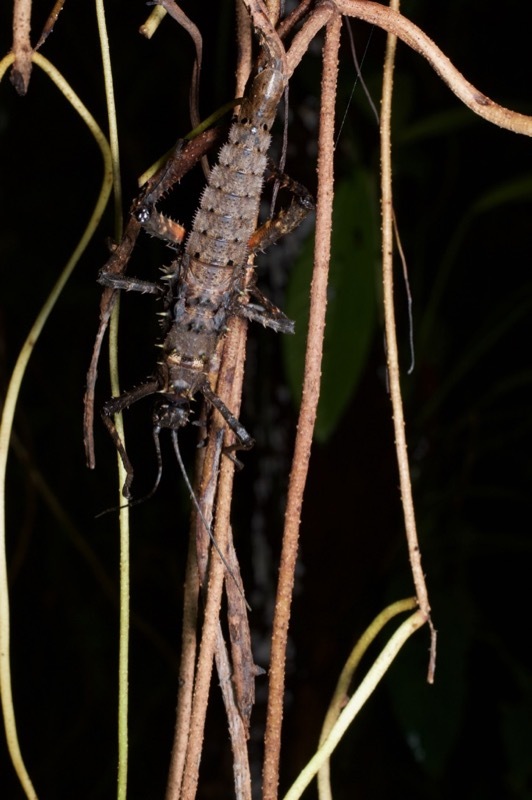 Also R.harrisoni are described as tree hole breeders with R.fasciatus apparently spawning in swamps. My amplectant pair were in a flooded area of a golf course. 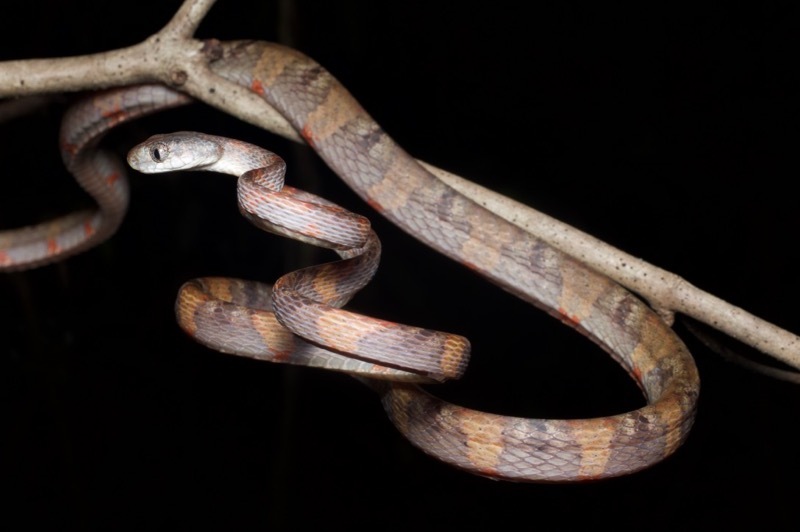 I think the earlier images I could find for the different species had me leaning towards R.harrisoni but the little evidence I have would certainly suggest your shout of R.fasciatus may be a better idea. - Wish I'd taken more photos now!